2. Line baking tray with tinfoil. 3. 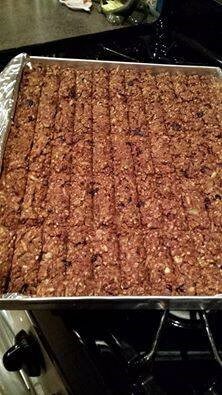 Mix Oats, Sunflower seeds, Cranberries & Almonds altogether. Spread mixture on a cookie sheet and toast in preheated oven for about 8 minutes. Return mixture to bowl. 4. In a medium saucepan mix together Salt, Peanut Butter, Honey, Coconut Oil & Brown Sugar. 5. Bring to a boil over medium heat, Stir. 6. Pour over Oats mixture and stir well, add chocolate chips if using. 7. Pour into baking tray. Press mixture down into with a spatula. 8. Bake for approximately 20 minutes. 9. I used a biscuit cutter about 5 minutes after it came out of the oven to cut into rusk size fingers. I found it much easier than cutting when completely cold.